The streets of Hollywood could look at lot different in the next 20 years. If we can all manage to survive that long. The city has released the new Hollywood Model Development Report conducted by consultants Fehr + Peers to plan for development in the Hollywood area by 2040, including streets and mobility. They operated on the assumption that nothing can be done to mitigate Hollywood traffic congestion, so the focus was providing alternatives to driving. In fact, the study calls for a number of lane reductions to make room for bike lanes, protected and otherwise — including protected bike lanes on Hollywood Blvd and Melrose Ave. Along with bicycle friendly streets as part of the Neighborhood Enhanced Network proposed in the 2010 bike plan. The bad news is, the plan is based on LA’s Mobility Plan 2035, which is already gathering dust on the shelf. And predicated on the support of Hollywood councilmembers who haven’t been elected yet. Then again, that could be a good thing, since the ones we have now appertains to be too risk averse to make the major changes necessary to provide alternatives to driving and improve safety on our streets. Let alone confront the angry drivers who seem to be setting the city’s transportation policy these days. Thanks to Brandi D’Amore for the heads-up. Great Twitter thread from LA Bike Dad looking at the long-lasting effects of racial discrimination in Los Angeles. And how it lines up perfectly with LA’s most dangerous streets. It’s definitely worth a click to read the full thread. And here’s what LADOT General Manager Seleta Reynolds had to say in response. As long as we’re visiting Twitter, Pedal Love discovered what may be the best ever bicycle sidecar. Marin Facebook users seem thrilled to see a group of bicyclists stopped and ticketed by sheriff’s deputies. If you have a strong stomach, it’s worth the click just to read the comments. Like this, for instance. Funny how people often want to ban bicycles from narrow roads because they think it’s too dangerous for bikes. But it never occurs to them to ban the cars that make them that way, instead. Never mind people, like the woman below, who think bicycling is too dangerous because of all the dangerous drivers on the roads. And somehow continue to believe the myth that if they innocently hit a lawbreaking bicyclist, they’ll be held responsible. Most of the time, no one is. And in the rare case when police blame someone, it’s usually the victim. Now you can be the proud owner of a classic 1989 Eddy Merckx team bike made for the late, great 7-Eleven team for the low, low price of just $6,700 US. As long as you promise to let me ride it. Candidates are lining up to fill the seat of CD12 Councilmember Mitch Englander, who is walking away from the district he was elected to serve. We’ll have to wait see which of the candidates support safer streets, if any. LADOT has released the environmental study for the Winnetka Avenue Street Improvements project to extend the existing bike lanes on Winnetka Ave.
After the recent disastrous proposal for a road diet on Pasadena’s Orange Grove Blvd, the city is giving it another shot with a proposal for a lane reduction, bike lanes and improved crosswalks on Cordova Street; a public meeting will be held to discuss it on Tuesday. Rose City NIMBYs and traffic safety deniers will undoubtedly be out in force to oppose it, so anyone who lives, rides or works in the area should turn out to voice your support. An op-ed on a San Jose website says the mayor’s recent bike crash was no accident, but blames bad road design instead of the inattentive driver. Only the other hand, the mayor says any head defects he may have were a pre-existing condition. San Francisco Streetsblog says no, bike commuting rates did not drop 19.9% in San Francisco, and 25.8% in Oakland, as reported in last week’s USA Today article. Oakland plans to speed up repairs on one of the city’s most dangerous streets, a week after a 14-year old boy was critically injured when he was dragged three blocks by a hit-and-run driver. Washoe County is continuing to build bike paths in the Truckee Meadows, despite a drop in ridership. US Education Secretary Betsy DeVos is one of us, after surgery to repair an undisclosed broken bone suffered in an undisclosed bicycling fall and/or crash. Evidently, it’s on a need to know basis. And apparently we don’t. A bike industry writer says e-scooters don’t appear to threaten the bright future of ebikes. An ebike maker is used as a model for how to successfully raise prices without losing customers after they get hit with a 25% tariff increase for parts imported from China. A Utah law firm concludes that downtown Salt Lake City and Provo are the state’s most dangerous places to ride a bike. A New Mexico State legislator is riding her bike 300 miles to the state capital for the new legislative session. Who needs employee parking? A Colorado company gave all of its 85 employees new $1,300 ebikes. A Colorado man put thirteen old kids bikes along his fence for anyone to take. Only to find others continually adding bicycles to the line to replace any that get taken. A 73-year old Michigan man has now ridden his bike across all seven continents after finishing a leisurely ride across Antarctica. An Ohio driver pled guilty to aggravated assault for a road rage attack on a man and his wife. But he did write a letter saying he was really, really sorry. An Irish boxer goes head-over-heels after hitting the skids on the streets of New York. The rich get richer. Bike friendly DC is going to get three new protected bike lanes in the next three years. A Florida man is being held on $10,000 bail after he was busted for riding a gas-powered bicycle, despite a suspended license for DUI. Treehugger says drivers should thank bicyclists for modern roads, instead of complaining about us. Maybe a hot bath doesn’t burn as many calories as riding your bike, after all. Life is cheap in Calgary, where a bike rider was charged for killing a 75-year old man as he walked in a crosswalk — except he was only charged with failure to stop at a red light. We can’t complain about killer drivers getting off with a slap on the wrist, and not hold deadly bicyclists to the same standard. A Toronto op-ed calls the modest bicycle one of humanity’s great emancipators. Police are looking for a British bike rider who smashed a driver over the head with his bike lock after a crash. Seriously, there’s no better way to go from victim to criminal than trying to retaliate against a driver. Or anyone else. A 20-year old English college student has set a new record for the youngest person to bike across the world, riding 18,000-mile through 14 countries in 159 days. Bike advocates in the UK accused the country’s Highway Code of victim blaming for tweeting that bike riders should wear helmets and “appropriate clothing for cycling,” rather than calling for safer streets and better driver education. Britain has been ignoring their own government agency’s advice to prioritize active transportation over driving every year since 2015. A man in the Netherlands was killed after somehow getting stuck between a fence and the roof of an apartment building bike shed; authorities were unsure what he was doing there. Although considering that he got stuck around 3 am, we can probably make an educated guess. Sure, let’s go with that. A Zambian man told a divorce court he used the used condoms his wife found in his pants to repair bike tires. No, seriously. There’s a special place in hell for whoever stole and vandalized a ten-year old autistic New Zealand boy’s custom-made three-wheeled bike. Once again, a cyclist has been stripped of his title after testing positive for a banned substance. Except this time, the doper is a 90-year old US track cycling champ. How bicycling became entrenched in Eritrean culture, despite the difficulty obtaining bikes and parts. And led to the first black Africans to compete in the Tour de France. Last year was the most successful year yet for Rwanda’s nascent cycling programs. Probably not the best idea to steal a police bike five minutes after you’re released from jail. Nothing like reading a six-mile long poem while you ride. And seriously, who carries a shotgun on a bicycle — let alone uses it on their riding partner? Thanks to Connie L for her generous donation to support this site. The holiday fund drive may be over, but donations are always welcome and appreciated. In an interview on KABC radio — which doesn’t appear to be online, unfortunately — Anastasia Mann, President of the Hollywood Hills West Neighborhood Council, said road diets create safety problems. And people in favor of them need a reality check. The bicyclists are supposed to follow the same rules of the road that the rest of us are. I’ve had near misses, where bicyclists turn right in front of me, turn against the lights, run stop signs…. nothing against bicyclists, God help me if I have to say anything that sounds like that, but it’s just impractical. You’re going to have safety issues because you cannot get emergency vehicles through. Got to give her credit for squeezing in virtually every anti-bike lane cliche in a few sentences. But this is the windshield-perspective attitude Hollywood bike riders have had to face in one of LA’s busiest and fastest growing neighborhoods, with no safe way in or out by bike. Or across, for that matter. The matter will be up for discussion at tomorrow’s meeting of Mann’s neighborhood council, which will take up the proposed Hollywood Community Plan. As well as their proposed response to it, also written by Mann, and a more detailed addendum. Along with calls to take most, if not all, of the bike lanes out of it. Infeasible, is the term they use, echoing the original draft of the 2010 LA bike plan. Which the city planning commission wisely rejected after bicyclists rose up to oppose it, demanding the safer, and more detailed, hard-fought plan we eventually won. That’s from a letter written from the Outpost Estates Homeowner’s group (scroll down), which seems to be far more concerned about the problems faced by the privileged few in the hills than the multitudes who live and work and travel down below. The meeting is at 6 pm Wednesday, at the Will and Ariel Durant Library Branch, 7174 Sunset Blvd in Hollywood. If you live, work or ride in the Hollywood area, you need to be there. To once again defend the bike lanes we fought for, before they ever even hit the pavement. Just be prepared to listen to people who live in multi-million dollar homes complain about traffic and density until you’re ready to poke your ears out. Boyonabike offers good advice for would-be bike commuters. A 74-year old man was critically injured when he was hit by a driver in a left cross while riding his bike in San Gabriel on Sunday. Thanks to Erik Griswold for the heads-up. Santa Monica votes to continue their annual COAST open streets festival on the same route through 2020. Unbelievably, though, the story talks about LA County holding open street events “more often than any other place in the country,” without ever even mentioning CicLAvia. If you have a Specialized Allez, your bike may be subject to a recall due to a defective fork crown that could affect safety. Wired says the dockless bikeshare wars are heating up after an infusion of funding. Thanks to Allan Margolin for the link. Minneapolis approves a proposal to build protected bike lanes around the University of Minnesota campus. Which should also be done at both USC and UCLA. Not to mention every other university campus. A writer for the Washington Post says yes, you can park your dockless bikeshare bike anywhere, but you shouldn’t. The homeless man who fatally stabbed a man riding his bike from Connecticut to Florida to propose to his girlfriend was once again ruled incompetent to stand trial. BBC presenter Jeremy Vine told a London government committee he sees 30 to 40 traffic violations by drivers every day as he rides his bike to and from work, and that roads have to be redesigned to “prevent ‘angry, dangerous drivers’ harming cyclists.” Which is a sentiment most bike riders would probably concur with. Caught on video: A British bike rider is caught in the equivalent of a right hook by a driver turning into a police station. Hard to tell from the video, but it’s possible that the driver may have passed the rider just before left-hooking him. And it’s also possible the rider may have undertaken the turning vehicle after it stopped and signaled. A Glasgow bicyclist says pedestrians have an obligation to help prevent crashes with bike riders, too. Perth, Australia puts the law of unintended consequences to test by installing speed bumps on a shared pathway to slow speeding bicyclists. Never mind that even expected bumps can knock bike riders off balance — especially when riding fast — resulting in falls and crashes into other people on the pathway. And lawsuits. Lots of lawsuits. Brisbane bike riders say it would be a big mistake to ban bikes from a new pedestrian bridge. The National Interscholastic Cycling Association (NICA) will conduct a two-year study to determine if high school mountain biking is more dangerous than other sports, such as football. Tragic news, as four teenage members of a Saudi Arabian cycling were killed in a horrific crash when a driver lost control and slammed into them during a training ride; six others were injured. Nothing like a stupidly hard gravel race through somebody’s house. If bored teenagers are causing problems, just offer to fix their bicycles for them. And the war on bikes cost West Australian insurers $60 million. The mythical war on cars, not so much. As a resident of the 4th Council District, and someone who walks, bikes, drives and uses transit throughout the City of Los Angeles, I strongly urge you to support passage of the Mobility Plan 2035 to increase safety on our streets, while encouraging alternative transportation, increasing livability and creating a more sustainable future for our city. It is vital that we have a well-connected bicycle network, including protected bike lanes, bike friendly streets and other safety enhancements, in all parts of the city to encourage people to leave their cars at home and embrace alternative transportation methods to improve the health of both our city and its residents. Bike lanes have been repeatedly shown to reduce injury collisions for all road users by as much as 50% — protected bike lanes by up to 90% — while improving the livability and health of neighborhoods and commercial corridors, resulting in increased property values, commercial occupancy and business receipts. Our city’s current reliance on automotive transportation is clearly unsustainable. Our streets are already at or near capacity, with little or no room to expand; even where expansion is possible, increasing capacity will only increase demand. We have no choice but to provide safe, viable and inviting alternatives to help remove some of those cars from the roads. It only takes a small reduction in traffic volume to create a significant reduction in traffic congestion. There are currently no safe bike routes in or out of my neighborhood in Hollywood west of La Brea, with few bike lanes and only sharrows on a handful of streets, most of which are too heavily travelled by motor vehicles to accommodate the overwhelming majority of people on bicycles, not to mention the 65% of people who say they would like to bike more if they had safer alternatives. We desperately need both the east/west and north/south bike lanes contained in the plan to encourage people to commute to work and school, as well as ride to shopping or family recreation. And I need them for my own personal safety; even as an experienced bicyclist, I must ride in fear anytime I leave my home on my bicycle, and take extraordinary steps to ensure I’m seen by motorists, even in broad daylight. I am also concerned by the unprecedented recommendation to remove bike lanes on Westwood Blvd from the Mobility Plan — after they were unanimously approved by a vote of the city council as part of the 2010 Bike Plan, which has been subsumed into the Mobility Plan, and which was part of a long public process leading to its approval. Westwood is one of the city’s most dangerous streets for people riding bikes, with over eight times as many bike-involved collisions as on similar streets in Los Angeles. Westwood is already heavily used as a commuter route by UCLA students, faculty and employees, as well as people who work along the boulevard and on the Wilshire corridor; this will only increase, perhaps dramatically, once the Westwood Expo Line station opens early next year. In addition, bike lanes could help revive the long declining commercial corridor along Westwood Blvd and bring more life to commercially failing Westwood Village. I urge you to vote to adopt the Mobility Plan 2035 as written to ensure greater safety and livability for everyone who uses our streets. A day designated to voice your support for the LA Mobility Plan 2035, which includes the hard fought bike plan passed unanimously by the city council in 2010. Yet that same plan is under attack by members of that same council, including some who voted for it just five years ago. And yes, I’m looking at you, Paul Koretz. 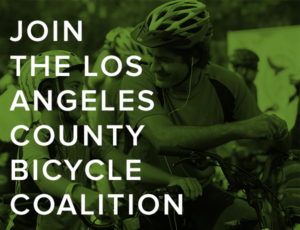 We’ll let the LACBC explain, as I shamelessly lift from the coalition’s weekly newsletter. The long-awaited Mobility Plan 2035 is coming before a joint council committee hearing at 2:30 p.m. on Tuesday, August 4th at City Hall Room 340 (Council Chambers). In the past several weeks, opponents have launched baseless attacks on the Plan’s bicycle and transit networks, with particular vengeance against proposed bike lanes on Westwood Blvd connecting to UCLA. The campaign was hot enough to get picked up by the Los Angeles Times, KPCC’s Airtalk, and UCLA Green Commuter Blog. As reported by the Times, Councilmember Paul Koretz opposes these critically needed bike lanes on Westwood Blvd. Worse yet, he wants to remove them from the Mobility Plan, not just block the project from being installed. Such a move would be totally unprecedented and reverse nearly a decade’s worth of bicycle advocacy on the Westside. The integrity of the Bicycle Plan itself is at stake. We need your help demonstrating the community’s strong support for a safer, more accessible streets in Los Angeles. Below you’ll find the email address, where available, and Twitter handles for each of the councilmembers; you should be able to contact the councilmembers without public email addressed through their webpages. Cyclists aren’t even safe from drivers on the race course, as yet another pro racer has been taken out by an official vehicle; Greg Van Avermaet had a 15-second lead on a solo breakaway when a race moto ran him down from behind. A British rider is the only one who didn’t know he’d just won the biggest race of his career. And cycling has lost the lead when it comes to doping. Too much sad news from the world of cycling this weekend. Ghana’s top cyclist was killed in a traffic collision while training. A 22-year old women’s racer died from an apparent embolism while on route to a Women’s World Cup race. And a Colorado mountain biker died following a crash near the finish line of a Crested Butte Enduro race. Richard Risemberg complains about being unable to get a sinkhole fixed, in a bike lane that doesn’t connect to anything. A man was found dead in an Anaheim alley with his bicycle around 4 am Sunday; no word on whether he was riding his bike or if it just happened to be nearby. Hopefully, we’ll get more details in the next few days. Who says cyclists aren’t tough? A former Marine from Escondido who lost both legs and part of his brain in an Afghan explosion just finished a 3,000 mile handcycle trip across the US. Marin County parks officials are being trained to use radar guns to catch speeding cyclists on fire roads, despite the lack of posted speed limits. Spokane cops bust twelve bike thieves with the help of a bait bike. On the other hand, when Chico cyclists tried to same thing, no one took the bait. Boulder CO motorists declare the “right sizing” of a city street to add buffers to existing bike lanes a failure in the first week, rather than wait to see if it actually works; the local paper explains what all the markings mean. Meanwhile, a law professor at the local university says buffered bike lanes cause car collisions and encourage law breaking by bike riders, resulting in traffic congestion that will increase noxious emissions and greenhouse gases. And evidently, will basically lead to the end of life as we know it. A letter writer from Pueblo CO says they should rip out that city’s bike lanes before it becomes a laughing stock for visitors, since there’s not a single bike lane in the UK or the rest of Europe. No, really, that’s what he said. A Houston lawyer bikes across the country just to talk to people and figure out what makes America tick. Two Iowa reporters created the world’s largest bike tour in the 70s because they wanted to ride across the state, and have their newspaper pay for it. A Kansas City paper says the city needs to move faster to finish promised bike lanes. Boston encourages people to park for free, and pedal the last few miles to work. When Bono honored the woman who came to his aid following his bicycling wipeout in Central Park, New York concert goers booed her off the stage. Bikes not guns, as 50 Baltimore men ride across the city calling for an end to violence. A Virginia advocacy group mails a users guide to local residents explaining how sharrows work, four years after they were installed and the city neglected to do it. This is why you never say you’re not hurt following a collision, as a 14-year old New Orleans boy is hospitalized with a brain bleed days after he and a friend were hit by a cabdriver while riding their bikes. A new movie looks at how bad planning is the real cause for the conflict between bikes and cars. 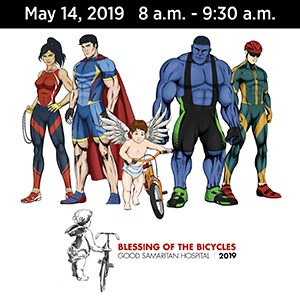 Other children pitch in to raise funds to buy a special bike for a four-year old boy with cerebral palsy in Ottawa, Canada. London drivers have a meltdown when roads are closed for a cycling event. An Irish paper catches 22 rule breaking bike riders in just half an hour. No word on how many motorists broke the law in the same period, though. Bangladesh factory workers beat a man to death for allegedly stealing a bicycle. A passing plumber with a second-hand defibrillator saves the life of an Aussie cyclist who was having a heart attack. Instead of improving safety on Western Australia streets, government councils want to let people ride on the sidewalk. China discovers randonneuring thanks to the efforts of a single cyclist. A style website explains how to make a bike your best fashion accessory, because how you look with it is far more important than where it can take you. But if you really want to make a statement, try riding a Big Wheel to the first day of an NFL training camp. And an eight-year old boy completes his first triathlon, despite suffering from cerebral palsy. Now then, what was your excuse? A local NELA newspaper offers a misguided editorial disguised as news, arguing against proposed bike lanes on North Figueroa Blvd (upper right corner; click to enlarge). Now, I don’t have a problem with anyone who takes a stand I may disagree with. Granted, I may get a little hot under the collar at times, but my attitude is they have as much right to their opinion as I do to mine. And I can learn more from people who don’t agree with me than I can from those who do. However, just because you own a newspaper doesn’t mean you get to make up your own facts. 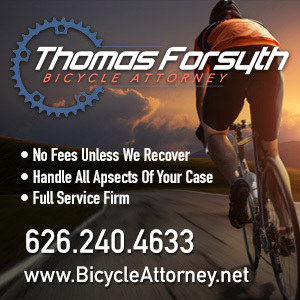 In this case, the writer, Tom Topping, claims — among many other highly questionable assertions — that studies show bicyclists are 12 times more likely to have a fatal collision than someone in a motor vehicle. Even though the studies I’ve seen say you are far more likely to die behind the wheel than riding on two. In fact, your lifetime risk of dying in a car is 58 times greater than on a bike. Meanwhile, a 1993 study shows that, even adjusted for comparable time spent driving and riding, you have almost twice as much risk of dying from driving as from bicycling. Needless to say, he doesn’t offer any support for his claim. He also suggests that bikes represent just 2% to 3% of traffic — again, not citing a source — so we should only be entitled to 2% to 3% of the roadway, apparently willing to relegate us to a strip 1.1 to 1.65 feet wide. For both directions, that is, not each way. And he makes the absurd assertion — again, without any evidence to support it — that bike lanes on Figueroa will add a full hour to an average commute. Never mind that the much lower delays projected by LADOT are worst-case projections that are unlikely to actually occur, let alone mutate into the automotive horror show he projects. No, far easier to simply make numbers up to support his NIMBYist anti-bike argument. 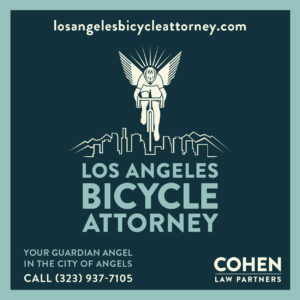 Actually, the carefully controlled study was conducted by a UCLA researcher as part of his class work, with support from the LACBC and funding from industry trade group Bikes Belong. If he thinks those are fanatics, I know a number of far more rabid bike riders I could introduce him to. And never mind that studies in other cities support that finding, concluding that rather than harming local businesses, bike lanes actually result in increased business. Then again, his style of riding may hint at one likely reason for his opposition to bike lanes, even as he reluctantly admits that bike lanes increase safety. Personally, I’d call a 30% reduction in fatalities a huge improvement. Never mind that every single study I am aware of shows that bike lanes improve safety for bicyclists, as well as others on the road, motorized or not — cutting injury risk as much as 50% with a simple painted lane, and 90% on protected bike lanes. He is right to suggest it’s best to assume drivers don’t see you when you ride. But to conclude that cyclists are less safe in bike lanes flies in the face of all available evidence. And once again, he fails to provide any evidence to support his bizarre claim that assuming no one can see him reduces his risk on the road to just 1%. If Topping or anyone else can provide a valid study supporting that assertion, I’d like to see it. And in an all-too-tired refrain, he concludes by complaining about the lack of outreach for a bike plan that was adopted over two years ago, following more than a year of public comment. So why does it suddenly become our problem when other people have had their heads in the sand for over three years, rather than engaging in what was a very public and high profile process? It’s his newspaper, and he can print whatever he wants, regardless of facts or fairness. Just like the big metropolitan dailies do. Long-time L.A. bike advocate Richard Risemberg, aka Mr. Bicycle Fixation, has started a petition calling on Governor Jerry Brown to sign a three-foot passing law to make up for the two he inexplicably vetoed. You’ll see my name right there as signee number two. Please join me in signing it, and forward it to every bike rider you know. Let’s let our governor know we’re not going to stand by and allow him to needlessly risk our lives and safety on California streets. This is why police investigators need specialized training in analyzing bike collisions. Utah authorities say that after a 10-year old boy riding on the shoulder of a highway was passed by a semi-truck, he rode into the traffic lane where he was hit and killed by a second semi-truck. A far more likely explanation is that the first semi passed too close at too high a speed, sucking the boy into the truck’s slipstream and onto the roadway, into the path of the trailing truck. But only someone who has experienced the terrifying power of that kind of slipstream when riding — or been trained to look for it — would understand that. Good news for distracted drivers, as Volvo designs the world’s first second cyclist detection system to recognize and automatically brake for bike riders in the car’s path; the first such system is called “eyes,” which come as standard equipment on every driver. And notice how they assume it’s the rider who will swerve into the car’s way, and not the other way around? Note to Redlands Daily Facts: It’s good that Redlands is getting more bikeways. But sharrows aren’t bike lanes, and bicyclists already have the right to use the full lane in many, if not most, situations; the presence or absence of sharrows doesn’t change that. Damien Newton asks what does it mean and what comes next now that the primary election for L.A. Mayor and City Council is over. LADOT has installed 123 miles of bikeways since the 2010 L.A. bike plan was adopted. Gary Kavanagh reports on UCLA’s Complete Streets Conference last week; nice to see the moribund Bikeside website come back to life to discuss it, as well. Curbed looks at the effects of AB 2245, which removed bike lanes from CEQA review. L.A.’s 4th Street is already a bike boulevard, whether or not the city wants to call it that — or fix it. Better Bike looks at the results of Tuesday’s election in the Biking Black Hole; it looks like the outsiders — and the only semi-bike supporter — may have won. Santa Monica College officially unveils their new 400 space bike parking lot. Fallen Cal Poly Pomona cyclist Ivan Aguilar will be remembered with a memorial ride and ghost bike today. CLR Effect notes that Southern California is becoming more colorful. Remarkable sometimes how easy it is to park in a bike lane and force riders to risk their lives in high speed traffic; no, Mr. Topping, that is an argument for better enforcement, not another reason to oppose them. San Diego’s city council approves an ordinance calling for safer recreational and commuter routes for bike riders. Bike SD makes the case for protected bike lanes on El Cajon Blvd. The San Francisco Bicycle Coalition rewards cyclists with chocolate for good behavior. Cyclist Chris Bucchere faces a preliminary hearing for killing a pedestrian in San Francisco last year. A Fresno school teacher is killed in a classic SWSS — single witness suicide swerve — as the driver claims he did everything right, but the rider inexplicably swerved into his path; thanks to Michael Eisenberg for the heads-up. Bob Mionske offers advice on whether to fight that ticket. AAA releases a bike safety video, which you may recognize as a Canadian video released last year, as the Bike League casts its lot with an organization that fights bike safety laws in California and elsewhere. Bicycle Retailer reports on Day Two of the National Bike Summit. The Bike League reveals what Congress really thinks of us — including that bike advocates are sore winners, while the economic benefits of bicycling dominate discussions with Congress. Outgoing DOT Secretary Ray LaHood calls for increased, high-quality infrastructure for people who ride bikes. How to recognize a Stroad. Stereotypes of who rides a bike are rapidly falling away. The driver accused of attacking a pro cycling team in an Arizona road rage assault defends himself online. A Colorado woman saves her own life through cycling, dropping 170 pounds in four years. At Austin’s SXSW one good Tern deserves another. Bike Safe Boston says ride straight through an intersection; definitely good advice for all the reasons they cite. Transportation Alternatives provides the facts about New York bicycling. A New York lawyer says the city needs to introduce strict criminal liability for traffic violence. Residents of one New York neighborhood don’t want their historic cobblestones ripped out to make way for a bikeway; for once, I might agree with them. While we all face harassment while riding, women can face a far worse kind. Bike-centric traffic signals go up in Montreal. British politicians lack the will to get anything done to promote bicycling, but London’s bicycling mayor BoJo finally unveils a real plan to remake parts of the city into mini-Hollands and change the future of bicycling in the city. A 94-year old British driver claims an unforeseeable medical condition left her unconscious behind the wheel and therefore, not responsible when she ran down and killed a bike rider a third her age. Perhaps the most subtly sarcastic bike advocacy headline in human history. Is Spain trying to force bicyclists off the roads? An Israeli company wants to turn your helmet into a heart monitor. A Zimbabwe man kills his father with a brick after they argue about borrowing the older man’s bike without permission, then allowing it to get stolen. Someone dumped uncooked rice on an Aussie bike path in an apparent attack on bicyclists. A Kiwi rider suffers a heart attack while on a cross country charity ride, and rejoins the ride just days later after heart surgery. Finally, after a drunk driver runs down a Florida cyclist and flees the scene, her father takes her to Mickey D’s before driving her to the police to turn herself in. A Florida legislator finds his drive delayed a few seconds by a bus, and responds by attempting to ban public buses from stopping on streets. And as bike ads go, this one for the British video release of Premium Rush isn’t half bad.